Internationally renowned DJ Andy Smith first came to prominence as Portishead's tour DJ on the long tour for the album "Dummy". He then made a name for himself with his seminal eclectic mix CD "The Document" which went on to sell over 100,000 copies. Since then he has travelled the world playing records across the genres and building up intricate mixes to thrill dancefloors. 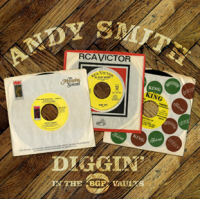 He first turned up on BGP a few years back with his highly successful 60s soul mix "Andy Smith's Northern Soul" which was allied to a club night that he was doing at various venues around the world. We have always wanted to ask him back and the BGP label's 21st Birthday seemed the perfect opportunity. This time we asked Andy to take his pick of the BGP catalogue and create a funky jazzy mix up. Andy mixes up every corner of the BGP catalogue from deep funk classics, through jazz and soul club dancers, some of BGPs greatest discoveries (like Billy Hawks and Billy Garner), and of course classic breaks as featured on our Super Breaks series. Using DJ techniques originated in the world of hip hop he carefully builds the CD to create a magnificent aural experience whether you want to listen at home or turn your home into a party.